available in various Engineering Departments of BIT Sindri College under this JPSC recruitment 2017. Eligible candidates are suggested to apply online on or before 19/06/2017 through official website of PSC of Jharkhand @ http://www.jpsc.gov.in. This JPSC recruitment of Assistant Professor Jobs 2017 will be filled up through written examination, Interview and academic qualification marks. For Available vacancies, Educational qualifications, Age limits, Application process, Selection process of Jharkhand Public Service Commission JPSC Assistant Professor Jobs Recruitment notification 2017 are given below. 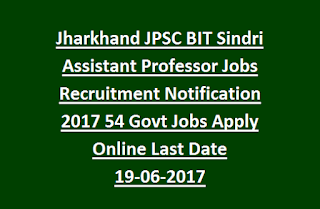 Click here to see the official notice of Jharkhand PSC Asst Professor Recruitment of BIT. Post Name: Assistant Professor-54 Posts. For Engineering Department wise vacancies refer official notification. Candidates must have qualified Engineering Degree/ Post graduation degree from any recognized university/ Institution. Candidate should have qualified NET/SET/SLET or PhD or GATE. For other qualification details please see the JPSC official Advertisement. Candidate age limit should be between 24 years to 37 years as on 01-August-2015. Age Relaxation will be applicable as per Govt rules. Selection for this JPSC Asst Professor recruitment will be held based on educational marks, written test and Interview conducted by the Commission. 1. Academic Record & Research Performance: 30 marks. 2. Written Test (Evaluation of Domain Knowledge): 50 marks. If the commission does not receive sufficient applications with valid GATE/NET/SLET/SET scores, commission will conduct a written examination. Written exam will be conducted for 50 marks (100 questions). For more details see the JPSC official notification. Application fee for BC/ EBC candidates is Rs. 600/-, Application fee for SC/ ST candidates of Jharkhand is Rs. 150/-. Interested candidates have to apply online through the Jharkhand Public Service Commission JPSC official website @ http://www.jpsc.gov.in. Read the official notification for general conditions and fill the application through online with all details. Last date for online application is on or before 27-March-2017. Closing date for the hard copy of application is 28-June-2017 to the following address. 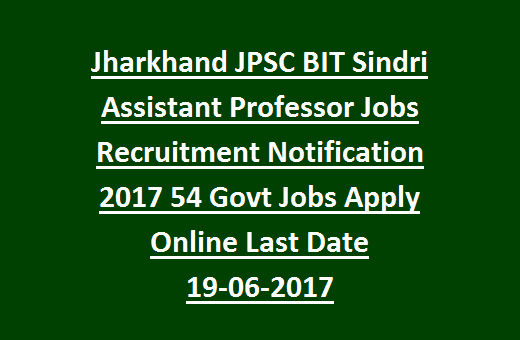 Click here to apply for the Jharkhand PSC BIT Asst Professor Recruitment 2017. Please share this Jharkhand JPSC Recruitment Examination 2017 Asst Professor Jobs 2017 article to your friends via social websites such as Google Plus, FB and Twitter. JPSC Jharkhand Recruitment 2016: Jharkhand Public Service Commission (JPSC),Ranchi has invited application forms from candidates for Associate Professor Posts. Total BIT Associate Professor vacancies are 49. JPSC will conduct Written Exam to select candidates for BIT latest vacancies. Send the Offline application on / before 24-11.2016 to the given address. Vacancy/Eligibility/ selection process/ application fee/ exam pattern details for Jharkhand Public Service Commission (JPSC) BIT Sindari are given below. Application form closing date: 24 Nov 2016. Total no of posts for Associate Professor (Engineering college) in BIT are 49. Age limit of candidates applying for this job is between 34 yrs to 57 yrs as on 01 August 2015 . Aspirants Should complete BE/B Tech or ME/M Tech with first class & MBA/ P.hD in relevant field. Monthly Salary for Associate Professor Jobs is Rs. 37,400 – Rs.67,000/- Plus Grade pay Rs. 9,000/-. ST/SC category candidates have to pay Application fee of Rs. 150/-. Interested candidates visit Jharkhand PSC Official website www.jpsc.gov.in and download the application .Fill the form with correct details and send with photocopies of required document/certificates. Send the application form before 24 Nov 2016.